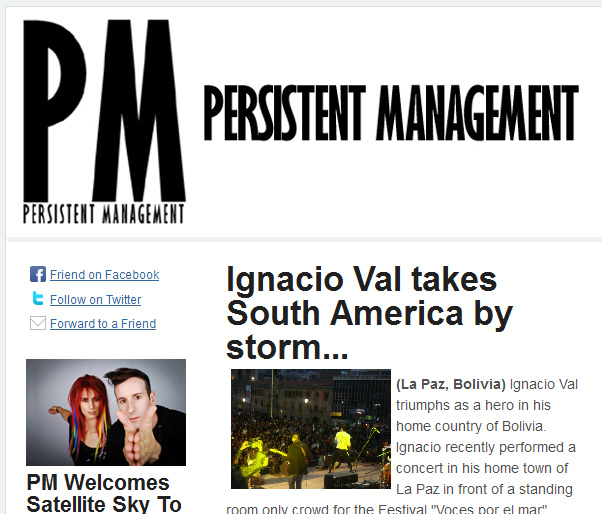 Watch the latest live video clip from Ignacio Val. Covering the Elvis Presley classic "Hound Dog"
New video posted Ignacio Val live taken from the MI Showcase covering the Elvis Presley Classic "Hound Dog" Ignacio Val | Hound Dog (Live) Watch it HD now! SONICBIDS AND PM TEAM UP TO SEARCH FOR THE NEXT BIG ROCK BAND! PRESS RELEASE: Entertainment entities Persistent Management and Symbiotic Nation unite to present a music industry showcase featuring Eric Knight, Ignacio Val and Satellite Sky performing at King King in Hollywood Wednesday March 28.